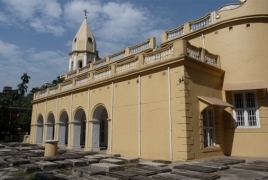 PanARMENIAN.Net - Armenian ambassador to India Armen Martirosyan on Tuesday, March 27 suggested that Bangladesh minister of culture take necessary measures to include the Armenian church in Old Dhaka in the UNESCO World Heritage list, the United News of Bangladesh reports. The historic church is located in a district of the city – Armanitola, named after the large Armenian community that once lived there. Martirosyan met Cultural Affairs Minister of Bangladesh Asaduzzaman Noor at his office in the Secretariat in Dhaka. At the meeting, the two stressed the importance of arranging cultural exchange tours, also discussing the opportunities of higher education for Bangladeshi students in Armenia and economic cooperation between the two countries. The minister said that Armenia's culture, especially cinematography, is very rich and invited Armenia to participate in International Film Festival in Dhaka. Martirosyan, in turn, informed that a musical troupe of Armenia will visit Bangladesh very soon. Armenians lived in what is now called Bangladesh for many centuries. Their numbers have diminished significantly, but there is a notable presence in the country, particularly in Dhaka.